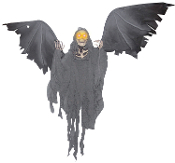 Plastic skeletal parts (arms are posable) with rotted, shredded look rags attached with large spread posable wings that move up and as though they were flapping, making scary sounds with light up eyes. 38-inch tall and 52-inch wing span. Requires 3 AA batteries, not included.